Distribution and habitat: Kalanchoe tomentosa is a succulent sub-shrub native of Madagascar. 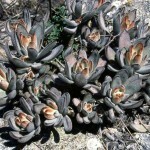 It is found on granite rocks, growing up to 45cm (1.5 feet) tall. The dense covering of hairs performs a vital function for the plant as water conservation adaptation. In the dry environment in which it lives, the plant must conserve what little water it can absorb from the soil. The dense mat of hairs growing from the leaf retards the movement of air directly across the leaf surface, thereby reducing water vapor loss due to transpiration process. In the same time, this unventilated space created by the numerous trichomes insulates the leaf from its harsh external environment, too. In addition, the white-silver appearance of the leaves reflects light, lessening the chances of the leaves overheating. 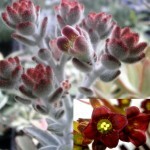 Description: The Kalanchoe tomentosa is a very handsome foliage species. It has loose rosette of oval leaves borne on woody stems up to 45cm (1.5 feet) high. The 3-8cm (1-3 inch) long leaves are covered with fine, bristly hairs, which are silvered-coloured except in patches at the edge, where they change to rusty orange on young leaves or chocolate brown on older ones. The thick stem produces branches and many groups of leaves, once it matures. When they are pruned well they have a kind of tree or bush look and can produce branches growing below pot level – therefore, this plant is suitable for growing in a hanging at this stage. The leaves are mainly oval shaped, although it is likely to have few leaves randomly grow in whatever shape and form. Although this plant can flower within its natural habitat, producing fuzzy, bell-shaped flowers in spring and summer – it is rare to see flowers bloom indoors, so it is grown for primarily its foliage within homes or offices. 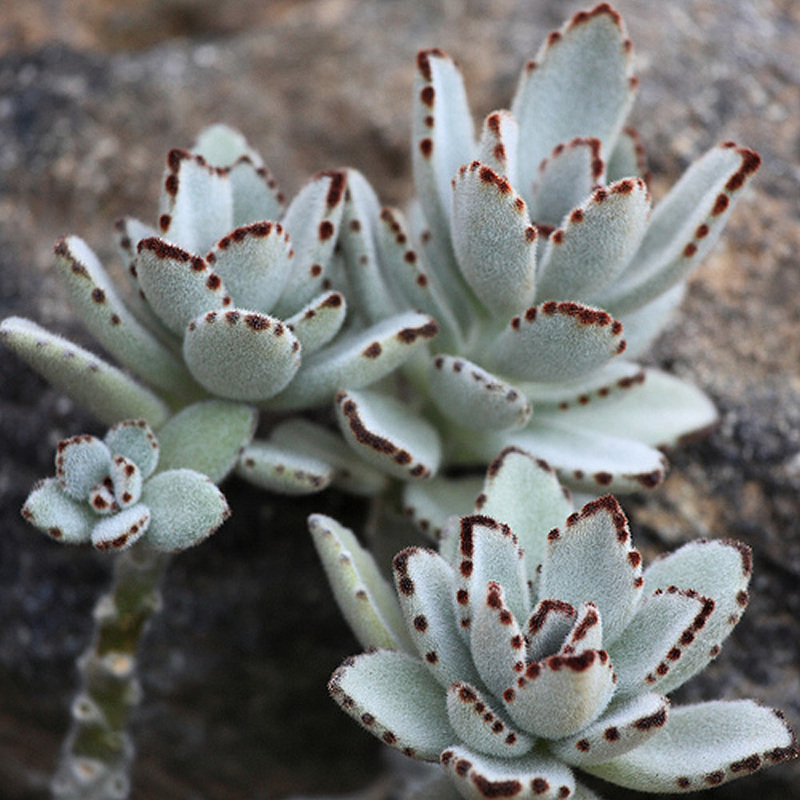 Proper care: Kalanchoe tomentosa is a fairly easy succulent plant species to care for and maintain. If the furry leaves of this plant need to be cleaned, brush them gently with a soft, dry brush, such as a small paintbrush. 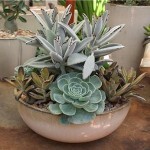 Light: Kalanchoe tomentosa is – like many other succulents loves growing in bright light and sunshine. This plant prefers a mixture of direct and indirect sunlight or shade. Temperature: Temperatures between 15-23ºC (60-75ºF) are advised. Like most plants, Kalanchoe tomentosa will benefit from good ventilation, but should not be exposed to prolonged draughts. Normal room humidity is fine and it may also tolerate dry air. 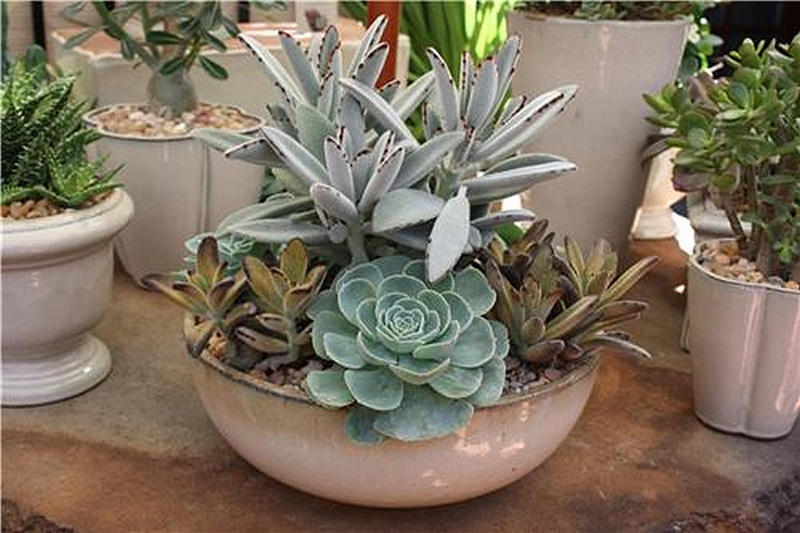 Watering: Only water Kalanchoe tomentosa once the soil has become dry and then soak the soil, but do not leave water in the bottom tray. During the winter this plant needs less water. 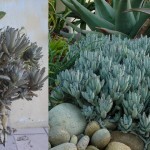 Because Kalanchoe tomentosa is a succulent – it stores water within its leaves – even if it is neglected for a period of time the plant will survive. Water from the bottom or water the potting mix. Avoid getting the furry leaves of this plant wet because they’ll easily rot. 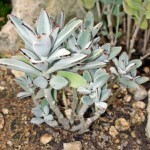 Feeding: Feed Kalanchoe tomentosa once every four weeks with a diluted fertiliser, from spring until the end of summer. Do not fertilise this plant during the rest period. 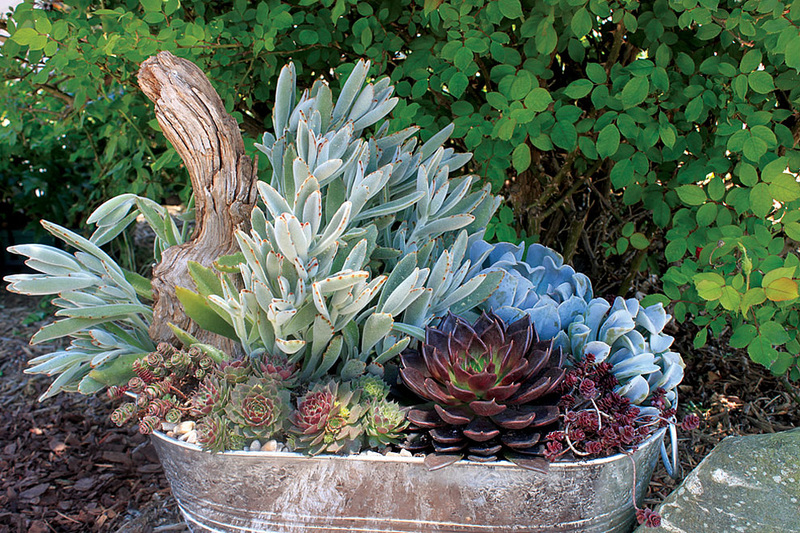 Potting and repotting: Use a cacti and succulent potting mixture or a soil based potting mixture with the addition of a small amount of coarse sand. Good drainage is important; have a shallow layer of clay-pot fragments at the bottom of the pot. Kalanchoe tomentosa plant is a slow grower which will only need repotting into pots one size larger once every two years and then less once it matures. The maximum pot size needed should be about 13cm (5 inch). 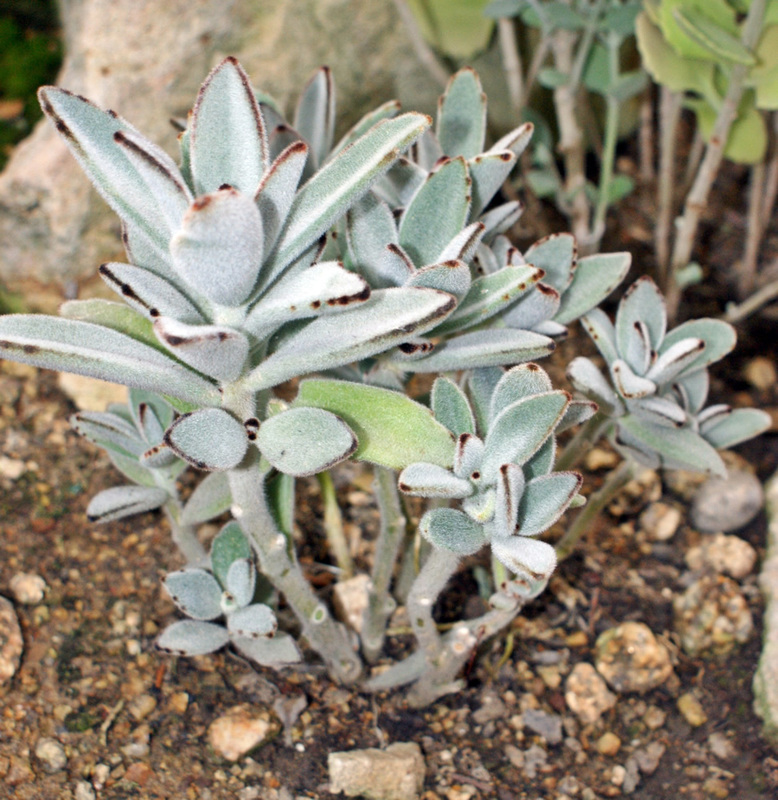 Gardening: Kalanchoe tomentosa is one of the easiest-to-grow succulents and looks wonderful mass planted in a hot spot in the garden. It needs dry conditions and is not suited to outdoor planting in high rainfall areas. 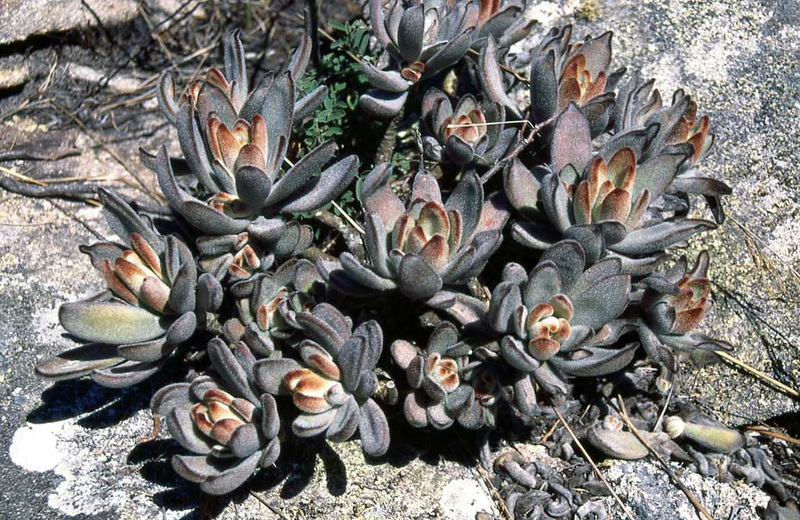 Kalanchoe tomentosa branches freely to make a prostrate clump. After a while, it can become straggly and should be clipped back to keep it in check and make it neat and tidy. They need warm temperature and should be kept at a minimum of 10°C (50°F). Protect them from frost. 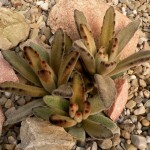 These plants come from very warm areas and may develop rot if kept too cool. 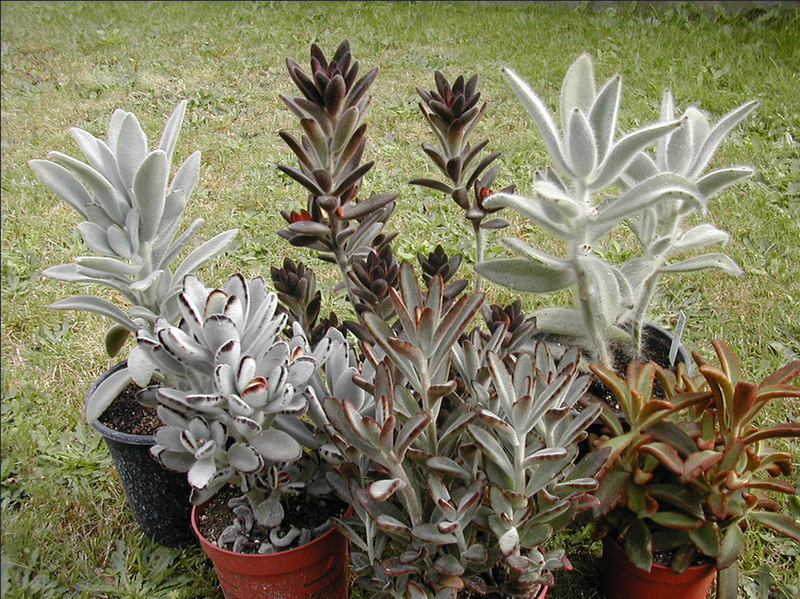 Position: Kalanchoe tomentosa plants need light shade or shade in summer. Bright light will give the plant a woolliest appearance. However, it should not be subjected to the direct sun of midday. Irrigation: Kalanchoe tomentosa plants are drought tolerant, but came from damper climates than most succulents and like more water in the summer. 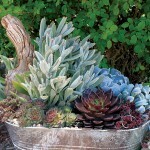 Plants are watered and allow to dry thoroughly before watering again. Fertilise: Fertilise only during the growing season (Spring and Summer) with a balanced cactus food or a liquid fertiliser diluted to half the strength recommended on the label. Propagation: Leaf cuttings can be taken and planted in new soil during spring. Give the leaf cutting a week of drying out before re-potting, then they are expect to begin rooting within 4 weeks. Propagation: It is propagated by stem cutting or by leaf cuttings in spring or summer. The trimmings resulted from shaping the plant, make ideal cuttings. Allow cuttings to dry out before repotting. These cuttings root easily in 8cm pots (3 inch) filled with a mixture of peat moss and sand. Place the pots in a warm position in bright filtered light. Water the mixture whenever the top 1-2cm (0.4-0.8 inch) dries out. The cuttings usually will produce roots in about 4 weeks. When roots have formed and new growth appears, move each young plant into a pot of standard mixture. Make sure that the pot is large enough to hold the roots. 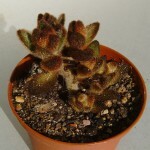 Thereafter, it should be possible to treat the plant as a mature Kalanchoe tomentosa. Problems: Kalanchoe tomentosa, like most members of the Crassulaceae family, have succulent leaves which are a great attraction for pests such as mealy bugs. While this species is no more prone to attack than others, because of the silvery-white hairy leaves, it is easy to miss the first signs of these pests. Treatment: A regular, careful inspection is sensible. Occasional watering with systemic insecticides based on Imidacloprid will keep the plants free of mealy bugs. If rot affects the plant, it normally starts at the root. Treatment: If spotted early, cuttings can be made easily from the tips of the stems to make new plants. Kalanchoe tomentosa cv. Chocolate Soldier: Individual leaves are more red-brown all around the edges and thinner and longer than for the standard species. It also grows a bit faster with more of a clumping habit. Toxicity: All parts of Kalanchoe tomentosa plant are poisonous if ingested. Uses and display: Once the Kalanchoe tomentosa plants matures, they look fantastic placed within a hanging basket or sitting in a conservatory. A conservatory is ideal because they do like their bright light and some sun. Whilst they are still small and growing, then near windows and on shelves which receive enough sunlight are good spots for displaying them. 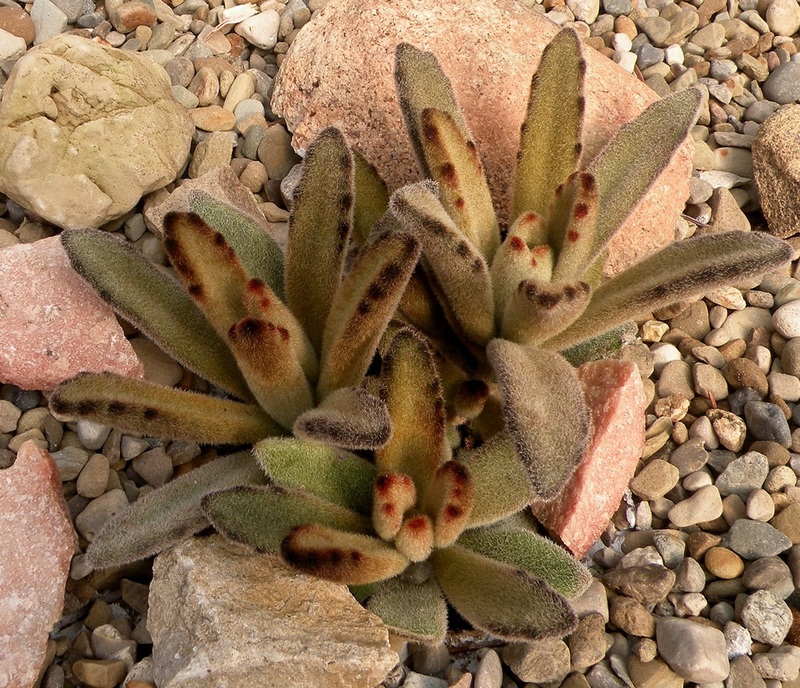 Grow this Kalanchoe tomentosa in a rock garden or on a rock wall in mild climates. In cold areas, this heat-loving plant is grown as indoor plant or it is planted outdoors as an annual. 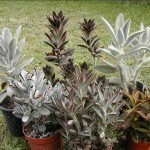 Kalanchoe tomentosa is drought-tolerant, therefore it is suitable for xeriscaping.